To cancell the reservation have to be 72 hours before the day of your estimated arrival. Check in is 13:00 hours and check out is at 12:00 m.d. 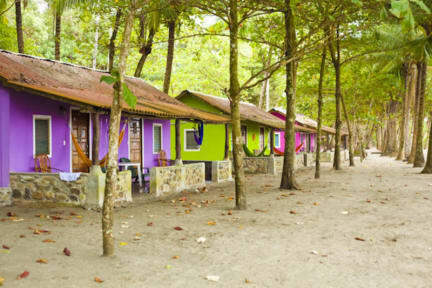 Oasis Surf Camp located in the Estero beach, Santa Catalina province of Veraguas in Panama, is the only guesthouse in front of the beach that provides a comfortable and relaxing family atmosphere where you can enjoy your stay without going anywhere. A very familiar resort which offers restaurant, comfortable private rooms (with a/c and hot water), a luxury star suite, free wi-fi, surf boards rental and surf lessons. All the rooms have fans (air conditioning is optional for $10 or $15), private bathrooms with hot water. The capacity of the room is from 1 person up to 6. Rooms come fully equipped with sheets, towels, toilet paper and soaps. The STAR SUITE is luxuriously equipped with everything you need. Two rooms, living room with sofa bed, dining room, luxuriously equipped kitchen, private bathroom with hot water and blower, satellite tv, dvd, private balcony with view to the sea and park. Can host up to 5 PEOPLE. You can get with your car to the hotel: there are parking spaces available, free WI-FI in the front desk area and satellite tv in the restaurant area. Our hotel has a restaurant that offers Italian and international cuisine, served from breakfast to dinner with affordable prices for customers. Also within its menu has meals for vegans and vegetarians. You should bear in mind that Santa Catalina has no bank or ATM, it is for this reason that our hotel account with payment by credit or debit cards (Visa, Master Card, Diner or Plus).